What Lucas Hnath has done in A Doll's House, Part 2 is nothing short of brilliant, and Stage West's regional premiere does it right. Read the piece and see the photographs at TheaterJones.com. Support arts reporting with your clicks! Fort Worth — “All happy families are alike,” quipped Leo Tolstoy. But unhappy families—those are the ones we love to watch. In its regional premiere at Stage West, Lucas Hnath’s surprising, ruefully funny, and entirely captivating sequel to the Ibsen original, A Doll’s House, Part 2, grabs us from the start and won’t let go. 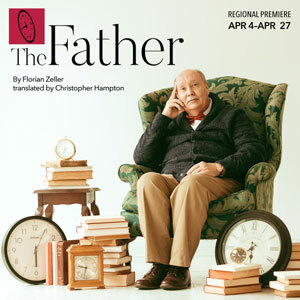 This is “must-see” theater, as compelling as a bonus episode for a long-gone TV series. Fifteen years later, here’s the Helmer family again—Nora, Torvald, the kids, the faithful housekeeper. And when the loud knock comes on the famous front door, we laugh out loud, knowing who it must be. Come in, Lucy, you’ve got some ‘splaining to do. And for whatever’s about to happen—shouting, reasoning, apologies, fisticuffs?—Hnath is giving us a front row seat. Brilliant. When Nora Helmer slammed out the door at the end of Ibsen’s 1879 classic, leaving husband and young children behind and shocking audiences on several continents, the world was left to wonder What Happened Next. Without any answers, literary types have spent nearly a century and a half looking at A Doll’s House mostly from a high-flying “macro” point of view: How did Nora’s bold move impact the development of modern feminism? Did the play change the Western world’s perception of marriage? Hnath’s clever concept is to zoom back in on this unfinished story, to restore the “micro” scale Ibsen started with: one man, one woman, one family. The questions are smaller, but more human: Where’s Nora been these fifteen years? Did she find what she was looking for? What’s the fallout when a wife and mother just disappears? Did Torvald change—and how was daughter Emmy (who doesn’t remember her mother) affected? One thing Hnath’s Nora is absolutely sure of: we modern audiences won’t be asking questions about women, men and marriage, inequalities and power dynamics—because “20 or 30 years” from where she stands (in 1894) all that was settled to everyone’s satisfaction...right? McGrann is a terrific Nora—edgy, smart, funny, proud of herself—and visibly nervous. She’s in a spot of trouble and has come to ask Torvald for help. From the lift of an eyebrow to a habit of smoothing her dress (is it a reset move, putting herself back in control?) there’s a lot of telling physical detail to McGrann’s characterization. Splendid in designer Jeremy Bernardoni’s jewel-toned traveling suit, Nora moves as if she were wearing jeans and a sweatshirt: lifting chairs like a stagehand, lounging sideways in a chair with her legs flipped over the arm, sitting straight-legged on the floor with a flask. She’s confident and worldy-wise…but being “back” is clearly more complicated than she’d thought. Torvald (an excellent J. Brent Alford) looks like an upright citizen in his swallow-tailed coat, but admits he feels “shaky” to find Nora in the parlor. Torvald is hard to read (has he learned anything over all these years?) but Alford’s sharply drawn portrait tells us there’s anger and hurt under the surface. Torvald has been waiting for years to say his piece. Not only did Nora leave without giving them time to talk, she’s now written a book about a fictional marriage like their own…and the Torvald character didn’t come off well. “I don’t want that to be the story,” he says. But is there a “new” Torvald Nora can work with? Has he opened his mind, or is this another smooth move by a controlling man? Hnath seems to know there’s no right answer: how we hear their arguments, their versions of the story, will depend in part on our own experience of love and marriage. Inarguably, though, both Torvald and Nora are self-serving and more than a bit ruthless—and as the play progresses we discover each has a serious “something” to hold over the other’s head. Could daughter Emmy (Amber Marie Flores) shake things up? Flores, poised and pulled in tight, is cool as ice to Nora, but lets her anger out in tiny controlled bursts, like steam from a closed pot. Did she miss her mother? “I’m better at life because you were gone,” Emmy retorts. She doesn’t read books, thanks, and is quite happy to be planning an early marriage. “I want to be possessed,” she says, in a quiet, devastating rejection of Nora’s own choice. It’s from Emmy that we hear the most detailed counter-argument to Nora’s ideas, culminating in a line about the future so cutting that there was a murmur from the audience. As Nora’s life and decisions become tangled with the family (and with Anne Marie, who reminds Nora she gave up her own child for the job she needed to survive—working women’s choices being starker than the ones Nora faced), we wait to see if Nora will be tempted, for safety’s sake, by a smaller life…or strike out on her own determined journey again. Hnath keeps us weighing her choices—and on the edge of our seats—until the very end. On Saturday, Nov. 3, audiences have a chance to see both productions in one day. Following the 2 p.m. A Doll’s House at WaterTower Theatre, the audience will caravan to Stage West in Fort Worth for dinner at the lobby Café, the 8 p.m. performance of A Doll’s House, Part 2, and an after-show discussion with director Shaffer. There is a discount for seeing both shows, but tickets (and dinner at Stage West) must be reserved at each theater’s box office: WaterTower Theatre, 972-450-6232; Stage West, 817-784-9378. On Nov. 17, the cast of WTT’s production will be guests at a post-show discussion at Stage West following the 8 p.m. performance; Stage West’s cast will be at the company’s post-show talk on Nov. 23.